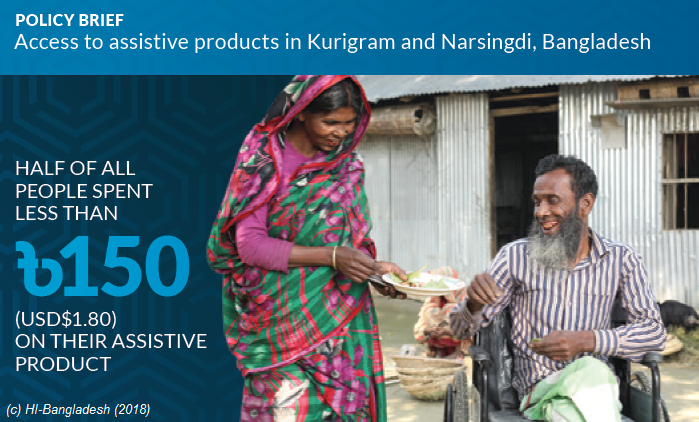 Completed as part of a European Union financed development project to strengthen and extend rehabilitation services in Bangladesh, this work aimed to understand how people access assistive products. Using the draft WHO tool helped refine methods to scale this work in other settings, and build high-quality, policy-relevant evidence to address the unmet needs for assistive products worldwide. The research found that around 7% of the population, and 18% of people over 60, use some form of assistive product, but that more than 70% of people who may benefit from assistive products, are unable to access them. Most of the products in use are home-made, and people with higher levels of need are least likely to have the care that they require. Mostly low-cost, home or self-made products, were used - half of all products were less than $1.80. Findings from this work are being used to re-think strategies to improve access to assistive products, particularly for those with greater need, and less capacity to pay. Assistive products, like wheelchairs, hearing aids, communication products, memory aids and vision aids are an important but overlooked policy area in disability inclusive development and public health. Commitments to Universal Health Coverage and age and disability-inclusive Sustainable Development are incomplete without strategies to scale-up solutions to enable access to appropriate assistive technologies.